Renowned geologist and lunar scientist Spudis (Blogging the Moon, 2011, etc.) makes a compelling argument that the moon’s many available resources may jump-start mankind’s pursuit of space travel. In the late 2000s, the news that the moon holds millions, possibly billions, of tons of ice at each pole stunned and excited the space science community. Ice is invaluable for two major reasons: it can be melted into liquid water, and its constituent parts (hydrogen and oxygen) can be harnessed and converted to rocket fuel. Additionally, lunar probes show that small areas near each pole are illuminated by the sun for most of the year, making them ideal locations for solar arrays to generate usable energy. The author writes that the lunar “resource bonanza” is tantalizing to those who hope to send humans back to the moon and beyond, as it eliminates the need for such resources to be hauled in from Earth. 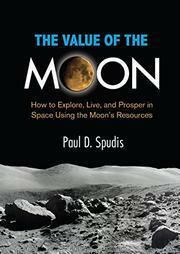 In approachable if at times technical prose, Spudis argues that the moon has everything we need to build a permanent moon base and that doing so can lay the foundation of a space transportation network. In fact, he argues that a manned trip to Mars may only be feasible if we establish a launch pad on the moon. To contextualize such an endeavor, this book is packed with historical, political, and cultural history about mankind’s on-again, off-again relationship with the moon, a saga in which the author has been intimately entwined. Spudis also provides a literal road map to settling on the moon that is tremendously exciting to ponder. The author’s deep knowledge and contagious optimism—even in the face of considerable government bureaucracy—make for fascinating reading that, happily, is not science fiction. A readable book sure to charm and thrill anyone interested in space exploration.